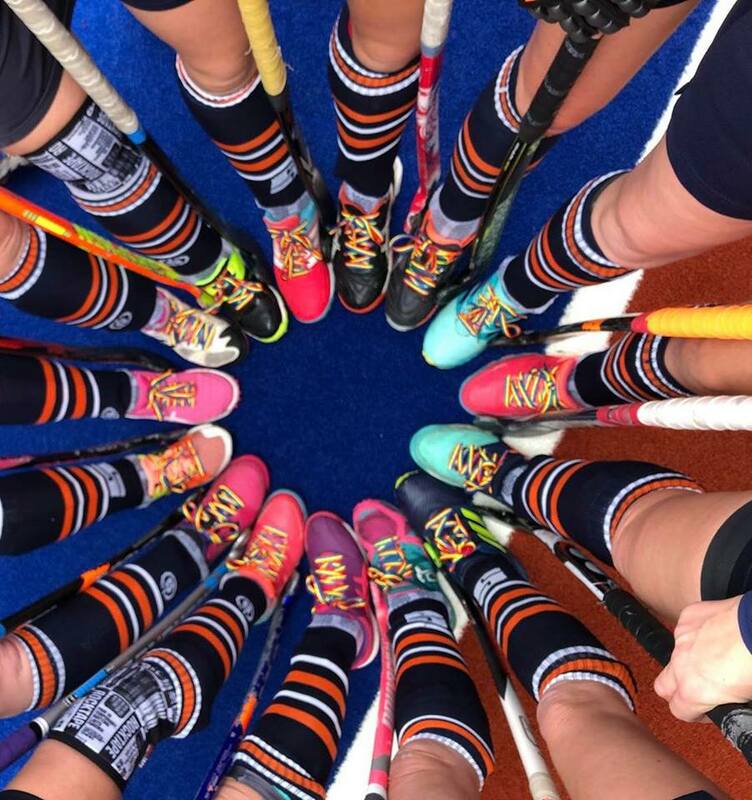 Some great wins at the weekend, with the Men’s 1st XI coming from 1-0 down to win 2-1, and our Ladies 2nd XI played a stormer of a match against top of the league winning 6-4 (the rainbow laces definitely helped). 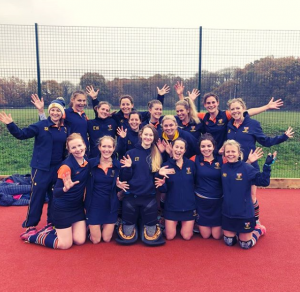 Our Men’s O40 began their England Cup matches with a fantastic 5-1 win, and our Ladies 3rd XI got a brilliant 3-1 win at home. Following on from a well-earned victory away at Oxford University, the OC’s welcomed London Edwardians HC to the fortress. A team with whom the OC’s have enjoyed a historically well fought and physical rivalry and a team that in the words of many ‘we owed one’. After a strong warm up, with some sharp shooting, the OC’s looked in top shape for the task at hand. However, this positivity was marred slightly, when Ben Wilson attempted a trademark Matt Murphy pushback, to aerial the ball into the corner and then press the opposition. However, not backing his aerial, the ball found its way for a sixteen, much to the bemusement of all on the pitch. The opening 10 minutes provided little action with London Eds having the slight upper hand with most the possession. With chances, few and far between the OC’s picked up slightly in the second phase of the half and looked like they may break the deadlock with a couple well-earned short corners. However, it was Eds that got the opening goal, a well struck hit from the top of the D. With OC’s keen to level things up, an opportunity arose in the form of a short corner. However, Matt Laidman’s flick from the top was unfortunately chased down by an Eds runner who got a lucky pickup, developing into a counter attack. The Eds players had rounded our keeper looking as though it was going to end in a goal. However, Giles Rozier kept his cool and made a fantastic last ditched tackle on the line clearing the ball. Going into half time 1-0 down, the OC’s received some encouraging words in the break. Responding positively, with a more aggressive press, the away side were forced into giving the ball away more cheaply. The OC’s soon began to string some more fluid patterns of play together and it was not long before Paddy Harman broke the deadlock, linking well with both the midfield and forward line to finish off an airborne ball that had deflected off the keeper at the near post. At 1-1 with 25 minutes to play, the game was still anyone’s to take and both sides had chances denied, kudos to the defence and Josh Doble for keeping such a tight ship at the back. The decisive goal came in the 60th minute when Matt Laidman muscled a straight flick from a short corner down the middle. The OC’s defended well in the final ten minutes to hold out for the win, especially when down to 10 men from a green card that was shown to Chris Wiseman. Overall, whilst this was not one of the teams most attractive performances, the team showed great resilience to grind a win from a goal behind and hold out for victory. Results elsewhere in the league were favourable, specifically a draw for Spencer, meaning that the OC’s can go into next weekend’s fixture against them with much optimism, knowing that a win will move them five points clear at the top. Saturday was cold and overcast but the rain held off as we arrived at local rivals, Surbiton to play their 3rd XI. We had a full squad, welcoming Avo & Ritchie back and after becoming a father last week it was a joyous moment when JJ walked into the changing rooms – congratulations pal! The first half was a hard fought game with Surbiton working hard on their press and did well to cut off our plays with some timely interceptions, with the defence working hard to hold off their rapid breaks when we turned over. Around the 20 minute mark, Surbiton played the ball into our D and after what looked like a Surbiton infringement (foot) a short corner was given against us – there was confusion and the other umpire had to step in, after brief consultation the short was disallowed. The guys immediately got into gear and played the ball quickly down the right to Dave Wilson who dutifully picked out Jimmy Smith in the D – he brought it in, struggling to match his pace with the ball to make a shot on goal, a mishit didn’t matter as the ball rolled over the line – GOAL! Or was it? Confusion again. Despite the goal initially being given the umpires disallowed the goal as our quick play from the previous disallowed short corner wasn’t played on the whistle and it would have to be replayed from our 16. Very frustrating for Jimmy Smith and the team. We got back into the game but we couldn’t hold off Surbiton’s uncompromising attack and they were 2-0 up going into half-time. The lads heads were down but we knew that we needed to pick up ourselves and get back into the game and with some positive words between the lads we started the second half with much better poise and confidence on the ball. We were holding the ball well and making some great runs, the lads were beginning to link up and a lovely line ball from Donny down the right picked out Cookie, who took the ball to the baseline and with a quick scan he picked out Philips inside the D on the far right post who received and set up an excellent strike into the net – GOAL! This time it stood! 2-1. We were back in the game and on the press, forcing Surbiton on the back foot with gaps opening up for us to work through. Donny picked out Henners down the right who crossed it into the D with Phillips on the far post again, another lovely finish and we were level at 2-2. The lads worked really hard to get back to this point but both sides were fighting for a win and the pressure stepped up. With minutes to go we were holding off but Surbiton attacked with pace and forced a play through the midfield and into our D, following up with a bullet strike on goal. 2-3. At 14.28 on the 17th November there was an audible “pop” as we ground out our win v L.Eds. Unbeknown to us gang warfare pervaded the hitherto peaceful pass time of league hockey. As Looshman grabbed hold of the back of his leg and somehow found his way to the safe house of the bench the sniper made their escape. The experts concluded the sniper was on the roof of the building over looking the 2 hockey pitches. Having spent the week tucked away in a protected environment amidst rumours of the South East London based Looshman being head of the opposition gang he ventured out on the 24th. As a precaution he was called back into the safety of the bench 42 minutes into Saturday’s game with a version of PTSD. Midweek saw the emergence of a second theory namely that the sniper was in fact a David Darbyshire an OCHC history maker. The suggestion was that he shot the wrong person, his real target Knappy due to the persecution he suffered in the late 1980’s and 90’s as unearthed by Martin Williamson. Sadly due to being a teacher Darbyshire was never able to fulfil his potential as an Olympic shooter so missing the intended target. Looshman was unwittingly caught up in the crossfire. Further conspiratorial theories emerged as the week went on. Not only did Martin publicise the facts of persecution to a chosen few but an early radicalisation training camp emerged. As a revered historical figure, Darbyshire was the first OC hockey player to ever receive a red card, a previously unknown fact saw the light of day. DD took the young Chris Porter under his wing and taught him all he knew over a period of some months in the Surrey desert known as Marcon. The rest is a series of further OCHC historical events. The corollary of the events of the week was the impact on yours truly whose utter ineptness on front of goal was a product of keeping en eye on the roof of the stand in case the SE23 sniper put in an appearance. In the words of Martin from one his match reports on the OCCC some years ago “Knappy’s performance was pig swill”. Having heard that the 4s had an ugly 2-1 win and on watching the 1s have an ugly 2-1 win we took the modern concept of trending too seriously and so had an ugly 2-1 win. We had Rosko to thank in the final analysis having played out a dour first half to be one down. We extended the early Christmas cheer of last week to the number of gifts we gave the oppo in the first 35 minutes being the architect of our own problems. We did say at half time that chances would come our way and they did, sadly to me. Ultimately all worked out with 2 converted shorts in the last quarter, West Sussex Eds clinching the 3 points when slipping home a well worked move to extend his excellent goal scoring record. Another game without a hint of cards although the last 2 minutes did see a quite extraordinary interchange of views between the recruited radical and their right midfield producing their Gucci and Prada to contest who had the better hair cut. Yet another tight game but 3 invaluable points as we reach a seminal point of the season with Barnes playing OGs next week with the former being impressive with 9 out of 9 wins and the latter impressive with only having conceded 6 goals in their games. Bored with the number of home games we have played this season we are away at Oxted followed by an away trip to Barnes to finish the first half. Brutus is under the distinct impression that I have a double life with another Golden Retriever. I have to accept the Darbyshire o D award for ensuring the watching 1s had some excitement. Thank you to Martin, Neil and Virge for all their umpiring of us in 2018 which is very much appreciated and saves us the tortuous task of finding unwilling volunteers. This weeks’ “where are they now” is far too long a list to write. A gritty performance and fight-back to secure three points against a determined Sunbury last Saturday. We began in somewhat comedy fashion with a kicking-back when the umpires (rightly) decided that it was not safe for Seb to play with a face-mask and no helmet. Cue key members of the squad driving back to the club to find a helmet. Sunbury took full advantage and scored early in a scrappy first half. We struggled to retain any possession and Sunbury looked the more likely to score again, but in the second half we found some rhythm and hit them on the break twice to score and hold on for the win. It had to happen and we did it in style. The wheels not only well and truly came off, the train kept rolling on and now we have to search for the tracks. Ostensibly a full complement of Stormers were ready and waiting for the visiting Maidenhead – who detoured via Surbiton’s ground in error. That they carried such a remarkable lack of direction on to the pitch makes our performance even worse. We started brightly and seemed to have regained our style and balance from last week. Passing and movement was decent and pressure resulted in a couple of corners. What flow there was to the match – and there wasn’t much – was interrupted by some ill-tempered bickering from the oppo, even with a clear goal advantage they felt maligned at every umpire’s call. Not a endearing sight and Closey had to stamp his authority, managing to restrain himself to issuing just one card. We knew we had to deliver in the second half but we got the basics wrong, started looking for magic passes and just couldn’t keep it together. When we did manage to string some passes, we couldn’t convert possession into goals. There were chances though. Toby ‘boom-boom’ Stevenson wound up some penalty corner strikes, Poen tested the keeper and Richie hit the post but it wasn’t to be our day. A match to forget but we live to fight on. We are still top of the league (at time of writing) but we’ll need to get this train back on the rails. The second round of the Mens O40s cup competition saw OCs host a spirited Purley Walcountians side not at fortress TD but, being shown our rightful place in the club pecking order (due to a minis tournament) at our second home of Oaken Lane. Luckily this late change of venue kept crowd numbers manageable (thanks for coming, Evo!). With a relatively full squad on show, despite player-manager Gerry pulling a hamstring through (foolishly) training midweek, Gav also rekindled his taste for the game as Rippers tried to lose the taste of whatever he was drinking the night before. Thankfully Rippers had managed to lose the Christmas jumper (half-time Hooch, anyone?) whereas Darren did not seem in the same state of preparedness and turned up to play in his wife’s tights. 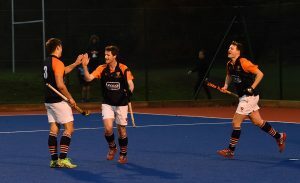 Once Gerry had remembered the starting lineup – at the third time of asking – the game got underway with a high standard of hockey from the off, OCs sprinting out of the blocks like caged tigers who had definitely not been celebrating at the club the night before. OCs quickly imposed themselves with sharp interplay, quick passing and great forward movement. Purley couldn’t live with us and looked outclassed for this sustained spell which led to Wizzer and JJ bagging a goal each and several other scoring opportunities being created. Looking on from the sidelines, a recuperating Closey (now following the Rippers Jnr school of alternative healing) was heard to comment “This could be a cricket score”, once again showing a remarkable lack of grasp of both maths and reality. The pace was not only too much for Purley but also for CB’s left leg and, not to be outdone by his successor as skipper, he decided to pull his own hamstring 10 minutes into the game and was forced to keep Closey company in critic’s corner. The game should have been put to bed in the first quarter as OCs exerted more pressure – JJ looking to score from anywhere (including outside the D) but we were not able to pull away and inevitably Purley were allowed back into the game as our dominance faltered in the run up the break. A moment of madness from the ever-reliable Heardy gave Purley a sniff and they capitalised. Were it not for an otherwise untroubled Nigel being in the right place at the right time (#nolookkeeping) they could have scored more. Given the proverbial kick up the jacksy, we managed to regain more of the possession late in the half with Wizzer dropping deeper to play in a previously unknown left-back-mid-forward role. It worked enough for OCs to bag another and go into the break 3-1 up. A well deserved lead but not feeling as comfortable as it should. Again starting brightly, we had strong link play with both Rippers and Cato spreading the ball wide and stretching the opposition, patiently looking for openings. We certainly had the better of the second half despite a slight wobble mid-way through as a resurgent Purley midfield was given greater scope and time on the ball. Tongy, Heardy and Cato were resolute in defence and Purley never really looked like getting back into the game. At the other end, as the game stretched we were able to commit Grimmer, Charlie and Gav forward in support of Wizzer and JJ, with each scoring a second; Gav using eyes in the back of his head and a hole in his stick to assist. Multiple chances were created and none better than when a loose ball was sent skywards towards an unmarked Richie in the D. The watching few were already celebrating the loose ball being powered into the roof of the net but unfortunately so was Richie and a swing-and-a-miss was the result. Several more surging runs ensued and after play had switched to the right Wizzer picked out Richie on the far side of the D with an aerial, this time for the recipient to control and play a quick ball into Gav who – surely cementing his place in the squad – showed great touch to deflect the ball in for our fifth and seal the win. The game was played out with this more comfortable cushion, Tongy even having enough time to put on an exhibition in our defensive corner. The third round game is on January 13th. 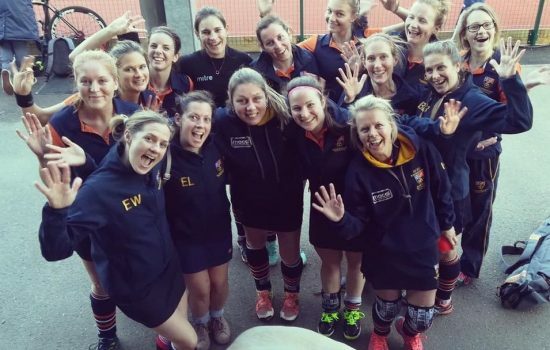 The Ladies 1’s travelled to an unfamiliar territory this week to take on the London Edwardians Ladies. With our 2-1 win under our belt, we were raring to go. We were completely dominating the game throughout, with about 90% of the ball played within their defensive half. Our passing was fluid and our attitudes were positive, it was only a matter of time until we scored. Despite the positivity, luck was not on our side, 4 short corners awarded to us during the first half and we were unable to convert any of them. Nevertheless, half time came and we did not let the nil nil score get us down. With some jelly babies in us we were determined to score a goal. The second half begun and we went on with a purpose and that purpose was to win. With some great passing up the right, putting our set plays we learnt from training into practise, we were looking very threatening. 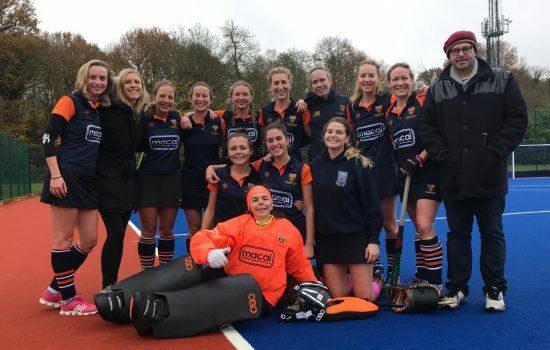 Katie Richards sent a strong pass to Georgie Sangster (who had just come back onto the pitch) , then BANG, the back board made a loud noise and we were 1-0 up! 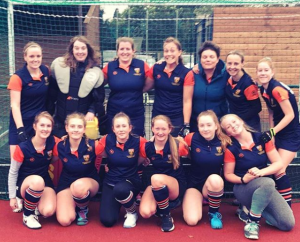 Well done to Georgie, showing us why she should be on the pitch! Very relieved we were hoping it was only uphill from here. Back in our attacking D again, the game was getting tense and the London Edwardians were not going to go down without a fight. Fletch (the warrior) took a stick to the eye and the game stopped, luckily the opposition had a doctor on their team so she attended to the injury and the game continued. With only 15 minutes to go, we slowed the ball down and concentrated on our defensive play. The London Edwardians tactic was to keep a player high so they could hit the ball up to them, unfortunately their tactic paid off and it was 1-1. With not long to go, we increased our intensity and focused solely on putting the ball into the goal. The whistle went and it was a draw – the score was not a true reflection on the way we played as a team, it was an unfortunate and undeserved loss. A shout out to Jackie who won MOM this week, a fantastic performance by her! 5-2 – Kara right post following a great through ball from Emma at Right Half (34 mins). Ladies Vamps 0-3 Croydon & Old Whitgiftian 2s Travelling with a full squad of 16 players, this was always going to be a difficult fixture against Croydon and Old Whitgiftian 2s. Sixteen players seemed to cause most of us confusion as we have never had so many players before and we couldn’t quite replicate the slick transitions that England Ladies seem to manage, despite being ably assisted by Chris. The match started at a hard and furious pace with Croydon consistently dominating midfield, always pushing forward, and the score line only remained at zero due to some fantastic defence work from Kate, Janet, Jenny and Paula. Vamps were unable make any headway on the attack, finding it difficult to push the ball through to the forward line. Croydon were eventually rewarded for all their hard work with a lifted goal just before the half time break. A motivational talk from Chris at half time settled us all down and the second half began on a much more positive note. We kept the width, we used all the players on the pitch, and some wonderful moving and passing from Alina and Georgina enabled us to make more attacking moves. Despite our best efforts we were unable to convert any of our attacking moves into goals, finding it difficult to penetrate their solid defence and an even more solid goalkeeper. Two more goals from Croydon followed, with the final score 3 – 0 to Croydon. It was a hard fought match and we should be proud of our commitment and play throughout. Thanks to Louise for umpiring, and thanks also to Chris for umpiring the first 5 minutes and then managing us for the match. Well done everyone. 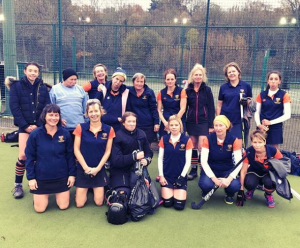 Ladies 3rd XI 3-1 London Wayfarers This was a bit of a crucial one for us this Saturday. After having a string of draws and losses we needed a win, both to lift our spirits and ensure we were in a comfortable position in the division. We all arrived ready to make it happen. But alas the oppo scored first within probably about 5 mins from a shortie. Gutted! However, we have learnt this season that we are stronger than last season. ‘Persistent’ is now our middle name! Surely we could come back from being 1-0 down? So we kept pushing forward (admittedly mostly down the middle of the pitch but we are working on using the whole pitch…plus you can never get bored of shouting ‘use the width’ ;-)) and it paid off, we pulled it back to 1-1. The dream of a win before the Christmas jumper party was still alive! Evie our RM who kept tirelessly driving the ball all the way up the pitch including some lovely spins to divert the oppo as she went, eventually had success! So we stood 2-1 up at half time. Knowing the oppo would come out stronger 2nd half and knowing that’s when we would have lost games in the past, we fought back to increase our lead. Fay finally got her well deserved goal and we just needed to keep calm and hold that 3-1 win. Needless to say, we did and I couldn’t have been prouder of the whole team! Feels great to get a win but even greater to play with a fantastic bunch of ladies who have really come together and made it work for us this season. There’s no stopping us now! Let’s make OK3s our grudge match next week and get a another win ladies!